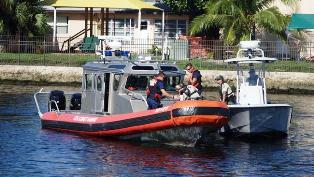 Several news agencies are reporting a fatal boating accident which occurred last Saturday night in the Pompano Beach, Florida Intracoastal Waterway. Though no eye witnesses have yet to be identified, at least one person heard the accident. Tracia Latino stated that she was watching television at her home when she heard a crash which sounded like thunder. Florida’s Fish and Wildlife Conservation Commission, which is investigating the incident, said two boats, one carrying five people and the other carrying two collided around 8:21 p.m. Authorities were notified that one person went missing after the crash. The Coast Guard halted all boat traffic for several hours in order to conduct a search for the missing boater. After a long search by several agencies throughout the night, the body of the missing man was recovered Sunday afternoon. Law enforcement later identified the man as William Alfred Ineson, Jr. Tagged: "Florida Intracoastal Boat Accident Law Firm" and "South Floirda Boat Crash Lawyer"